Secret Hideaway is a secluded 1 bedroom, 2 bath cabin with the added bonus on an extra guest room. This cozy cabin offers an indoor jacuzzi for a relaxing... VIEW NOW. 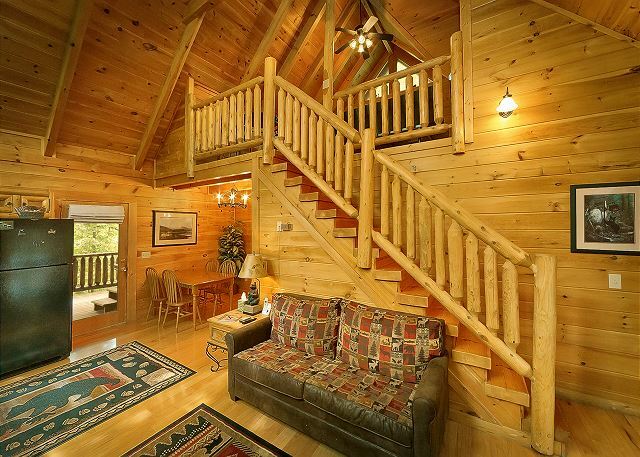 Location: Sky Harbor Resort between Gatlinburg & Pigeon Forge This private luxury log cabin is a great vacation rental in the wooded resort of Sky Harbor. You'll enjoy the wonderful amenity package at this cabin. Walk into a great room that includes a stone fireplace, living room, dining area, & full kitchen exquisitely decorated for an amazing vacation to the Mountains. You'll enjoy rockers & a premium hot tub on the back deck. Enter the bedroom where you'll find a premium King bed, jacuzzi, TV, & direct access to the bathroom. Go upstairs to the loft and enjoy your own premium pool table and television. There is also a bathroom for your convenience in the loft. This log cabin has Wi-Fi internet access for those guests that need to check their emails, social media, and business during their stay! 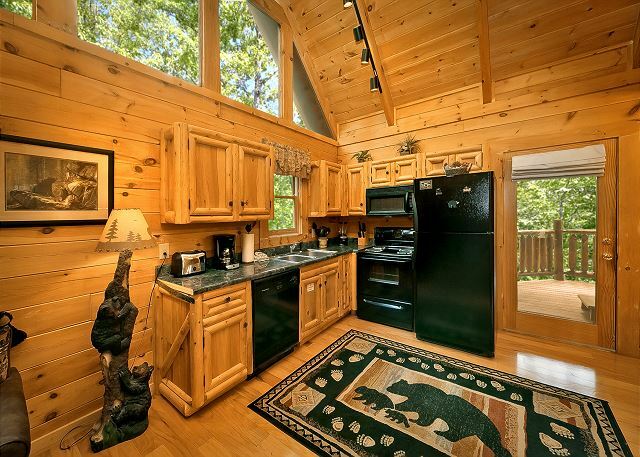 "The Tree House" is a private, one bedroom log cabin that sits high above The Great Smoky Mountains Parkway between Gatlinburg and Pigeon Forge, Tennessee. 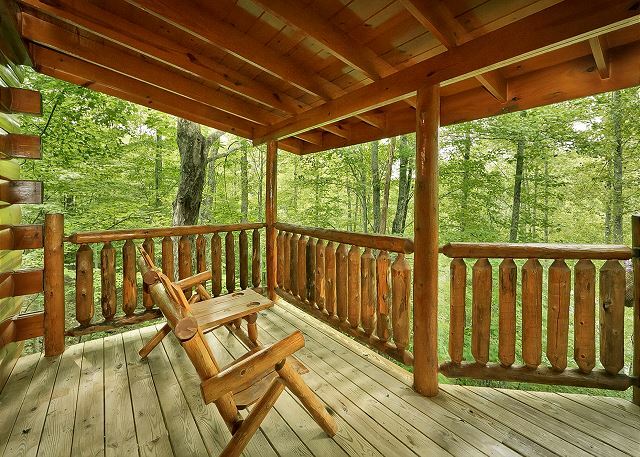 Beautifully decorated by the owners, "The Tree House" includes all the amenities you need to make your Smokies vacation a comfortable and memorable one. Unwind in your hot tub after a day of hiking in the Park, or relax in front of the fireplace with a good book or watch HDTV. Upstairs in the loft, you'll find a pool table to test your competitive skills. 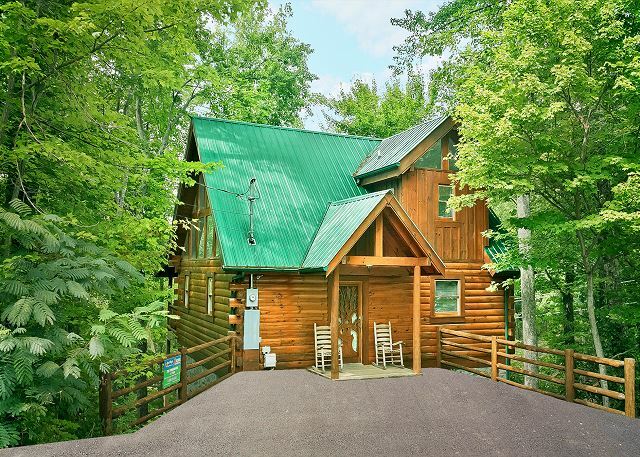 This cabin is only 6 minutes to Pigeon Forge, 8 minutes to downtown Gatlinburg, or only 10 minutes to the Great Smoky Mountains National Park. Sorry, no pets allowed! This cabin is priced for 2. Each additional person is $12.50 nightly. Kids under 12 are free. No pets or smoking at this cabin please. There are three of us: wife, 10-year old son, and me. We wanted a cabin away from everything else, and that's exactly what "The Treehouse" is. It takes a good 15-20 to drive up the mountain from the main road just to get to it! Only one more house was above us on our road. Pros: There is a king-sized bed in the main bedroom, which is VERY comfortable. The kitchen was well-stocked with what you need to cook and clean. Bathrooms were ultra clean and well-stocked. The hot tub was perfect (our son used it every day!). The view was nothing but trees, which was just fine with us, because we just wanted seclusion. Cons: The only other bed is a sleeper sofa, which is not that comfortable. Pictures from the site show a futon; there was none. The pool table is sort of useless, as you cannot fit to hit a ball because of the size of the room. Lots of spiders and spider webs on the front of the building and on the back porch. I would stay here again, especially if there was a more comfortable bed for our son. The cabin was so beautiful, it was in a perfect location with a beautiful view of the woods. It only took like 5 mins to get to downtown where everything was which was so convenient. The cabin itself was so cozy inside and the bed was very comfortable. It was hard to leave I wish we could’ve stayed longer. Overall it was an excellent experience and we will definitely be coming back to rent from you all.. Thank you!!! The cabin was clean and in a great location a few minutes from both gatlinburg and pidgeon forge. We loved our stay it was wonderful. Wonderful time renting the Tree House cabin. The location was perfect. Will be back for more of what this wonderful Motorcycle riding state has to offer and will be staying at Aunt Bugs cabins! Absolutely beautiful cabin in a beautiful setting. Already planning a return trip. Washer and dryer was an added bonus! Loved this place. Only negative is that the back porch gets a little more noise than we would have liked because it is near a main road but you do feel like you are in a treehouse when in the hot tub. Had a wonderful time and would love to return one day. Asked for someth8ng in the middle...part of the way pigeon Forge and about the same distance from Gatlinburg. Great cabin, enjoyed the privacy and comfort. It was an awesome experience. 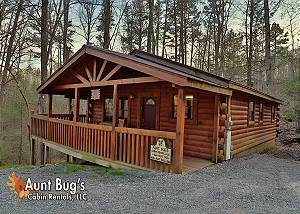 Most if not all the cabins are in the same price range...and I called several rentals prior to calling Aunt Bugs. I chose to rent because the excellent customer service from the first hello. They took time to answer my questions and made suggestions where appropriate. Will rent with them again. Cabin was clean and comfortable. Location was great. Even got to see a bear with cubs pass by. Relaxing vacation. We had such a blast. The house was gorgeous and just perfect for a couples getaway. The location is perfect the privacy and the wonderful hot tub. Did not have a single issue. We definitely plan on using aunt bugs for future cabin rentals with friends and family and will book here for a getaway next time ! We stayed at the Tree House cabin and it was great! Looks exactly like the online pictures and was very clean! Me and my husband loved the jacuzzi! We had a great experience. Check in was simple, the staff was very helpful and the cabin was exactly like advertised. My girlfriend and I had a great time! We will be back to stay again! Our vacation was everything I had hoped it would be. So nice to come back in the evening and enjoy dinner at home, game of pool then a Hot Tub. Internet description of cabin and amenities is well represented. Very nice place and enjoyed our stay! Cabin was excellent; great place for a couple to unwind and forget about the demands of daily life. We enjoyed a very relaxing experience at this cabin. Really enjoyed the grill. Charcoal great method!! Enjoyed the hot tub after hiking in the Great Smokies. Great location for getting to the mountains. We had a great time staying in The Treehouse, it was close enough to everything but also secluded. The property description was accurate and included all amenities listed. The property could use some dusting, the bed and couches seemed over due for replacement. Our most enjoyable part of the cabin was the back deck with the hot tub, seating and grill located right off of the kitchen. When we arrived it was dark, the roads to the cabin are steep and narrow, the parking area in front of the cabin is steep on the sides and the porch light to the cabin was not functioning so it was a little difficult getting parked and getting our luggage into the cabin. The property managers were very professional and provided great customer service. My husband and I really loved The Treehouse! It was our favorite cabin after many years of cabin rentals! Loved the layout and the location! The only complaints I have were the sofa wasn't comfortable and tv in living room a little small for the space but certainly not deal breakers. This was the most perfect getaway for a couple. The Treehouse was cozy and peaceful. I didn't want to leave!!!!!!!?? I wanted a comfortable vacation spot that was close enough to a wide range of activities and I was not disappointed. A very well maintained cabin that I was very pleased with. We were pleasantly surprised to see the cabin was exactly as pictured online. The weather was perfect, the stay was so relaxing. We left a bear memento, as had previous guests, to show our appreciation of a wonderful time. Thanks Aunt Bugs, we'll be back. Absolutely beautiful perfect cabin to rent. We had a great time. The cabin was as pictured, clean and comfortable. Know that there are other cabins nearby but we still had plenty of privacy. As is most of the area, the roads were not flat or straight but I was still able to maneuver a motorcycle trailer to the cabin. We loved our cabin and so much fun playing pool with our grand daughters and being in the hot tub. If we are ever in the region again we will certainly be up for staying again. We were very impressed with the cabin and its location. Loved the quiet . Only suggestion: needs a new sofa. We had to put pillows from the bed in order to be comfortable sitting there. This cabin was very nice! Everything I was expecting. Very clean, nicely decorated, secluded but still close to Pigeon Forge and Gatlinburg. The snow was a *****. But, Charlotte is already ready to go back when the weather breaks. Our stay was wonderful! A great stress free weekend in a beautiful cabin! Such an amazing first experience using this company. Very reasonably priced. Will be using them in the future! I loved where the cabin was located but the bed was not very comfortable it sinks in the middle. The furniture in the living room should be vacuumed off it was very dusty. The upstairs there was mouse droppings all over the floor. It's a beautiful cabin though. Loved the cabin and used everything it had to offer. While I would prefer a gas grill the charcoal grill worked fine. The hot tub could have used some TLC but we still used it. All in all it is a cabin in the woods and was very nice! We thoroughly enjoyed our time at the cabin. Only one issue: The hot tub was not working upon our arrival. Maintenance was quickly attentive to the situation and had it up and running after several trips/parts ordered. The location is secluded and quiet. The cabin itself is well maintained and very cozy. The property was just as surprises. A beautiful cabin. No problems. My only suggestions would be that the owner provide directions for things like the TV remotes and the hot tub, etc. Also wifi. It took a little time to figure things out. Although the drections to the property were given and written out it would be helpful to have a map of the area in case you get off the path as we did. Very nice cabin. Our kids loved having the pool table and the hot tub. Very close to all of the things we wanted to do. steaks on the grill also on the deck. the forest floor. I will be back in the future. 1. There was a dead roach in the wastebasket. 2. Sink drain had "gunk" in it that I had to remove. 3. I had to clean the grill rods. 4. The couch was uncomfortable. 5. There were two remotes with no instructions on which one to use and how. We enjoyed our stay at the Tree House, it was very nice and comfortable. My wife and I very much enjoyed our little weekend getaway in the Tree house. It was a wonderful cabin and we would definitely reccomend this cabin to anyone. We loved the TreeHouse, and are already planning our return visit. Everything we needed was there, we just had to shop for our food. And the bed was very comfortable! The only bad thing is now I want to buy a cabin and move to Tennesseee! I didn't want to leave! Want to thank Steven for finding my clothing and shipping for us. Loved the layout of the cabin and very cozy. Thank you. Awesome! My husband and I loved this cabin with its great location and cozy atmosphere. We can't wait to plan our next vacation in the mountains. From start to finish, top to bottom this cabin rocks! Location was great, size for us (2 of us) was perfect, condition of cabin could not have been better. If and/or when we buy or build our own cabin this is our model. 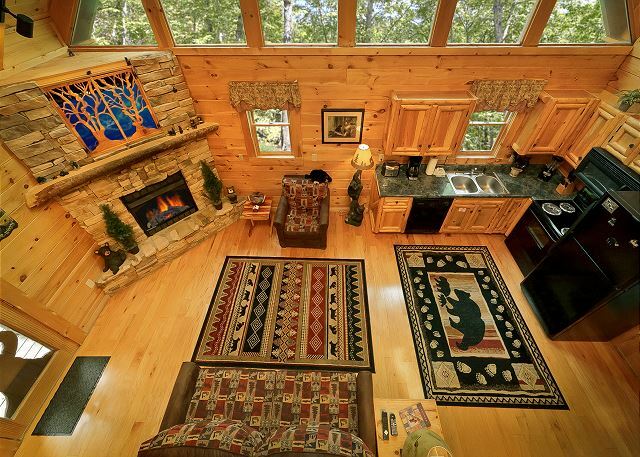 When we take our next trip to the Smokies, we hope this cabin is available. Awesome. Was a really good place for a honeymoon. We plan on coming back in the future to vacation with family. The road into the cabin was fun, little narrow in places. Follow the map they give you & you will make it in fine. The hot tub could have been a little cleaner but overall was great and fully stocked in the kitchen. Great location! Had a wonderful time and look forward to staying again in the fall! Wonderful quaint cabin in the woods! A PERFECT getaway!! We LOVED it!! This cabin is amazing! Small on the outside but the inside doesn't feel small at all. Relaxing and conveniently located. Not too far away from everything but not too close either. Everything was perfect on our honeymoon! Very beutiful property,easy to get to, close to gatlinburg and pigeon forge but located just faraway enough to feel secluded, we will be back again next year. Cabin was very clean and perfect size for a couple who want to get away. Close to Gatlinburg and Pigeon Forge, good location. Great staff, clean cabin. Just a great place to stay!! Everything was clean and neat when we arrived. Cozy stay as well. Fantastic! Cabin was as advertised, and staff at Aunt Bug's was great to work with! Overall My Wife and I had a wonderful stay and totally met our expectations. If you want us to get picky one of the remotes had dead batteries and the kitchen table was a lot cleaner after I took a rag to it. Also, your cleaning service was kind enough to leave some donuts and peanut butter and crackers. I assume there breakfast and lunch was left on accident. One last thing and again this is just a heads up there are a few visible cob webs along the track lighting that looks like it's been there for a while. Like I said overall the cabin was wonderful got a visitor from a raccoon on our last night 😀. Thank you Aunt Bugs for giving My Wife and I a memorable Anniversary. Your cabin is beautiful and the stay was great! We had some trouble with the hot tub but that was probobly operator error. Over all wonderful experience! My girlfriend and I had a really great time! We loved being back up in the woods. We loved the pool table and Jacuzzi. There was no bad experience. We are going to tell friends and family about our stat with y'all. We hope to be back soon and rent from y'all again.. Thank you so much for allowing us to stay and have a great time! Thank you again! I have stayed several times at different cabins with aunt bugs.. will return again!! The cabin was very inviting and peaceful. Its located very close to Pigeon Forge and Gatlinburg. We absolutely loved the cabin. Wonderful time and well decorated and clean. We had a blast and will definitely be booking our next trip out here again with aunt bugs! Staff was friendly. Cabin was nice and check out was easy. The stay was amazing, the cabin was beautifully decorated. We dated for our honeymoon and it was more than we could have imagined, we will be back for sure next year! Everyone was super friendly at check-in and like the followup call, Will be back in the fall! Cabin exactly how described. Loved the privacy and how quiet it was. I've never had such an awesome experience when renting a place. Very curtius staff, wonderful discounts, and great communication through phone, email, and app! The cabin was very nice and was a pleasant surprise when we open the door and walk in. I would definitely rebook again soon. Great with check-in. Hot tub could have been cleaned a little better. Everything was great with one exception. There was no trash/dumpster outside for the removal of the cabins trash upon check out. If there truly is not one then the renters should be advised as to leave their trash in the cabin, however the accommodations were great which made the stay worth the drive! The cabin was very clean and very closey to us! We had a great vacation with Aunt Bugs Cabins. Our cabin felt like home to us and had all the amenities we needed and wanted. My husband and I loved our stay at Aunt Bug's cabin. It was my dream to stay at a beautiful log cabin. It was on my bucket list to do in the future so my loving husband brought me here. We had a wonderful time this week. Thanks for the memories. The check-in process was easy and smooth and the cabin was ready early so we were able to get in. The cabin was pleasant and very relaxing. It was more like a luxury condo than a cabin - we were very impressed! Great cabin. We did have a hard time getting to it because we're not use to that terrain. It would be nice know the difficulty of the cabin location. Over all you guys did a great job. Your phone apps are great. During our check in and check out the customer service was wonderful. We had a great experience and would definately come back. Very relaxing atmosphere and the location of the cabin right between Pigeon Forge and Gatlinburg was great. The staff in office very friendly and helpful. We will definitely rent from this company again! We had a great time, cabin was very clean and welcoming! Would definetly book with you again! So far it has surpassed my expectations. This is one of the nicest cabins I've been in.